Introductory Offer: Save 50% on Agarose LE by using promo code AGAROSE50 at checkout. USA customers only. Offer expires November 30, 2018. 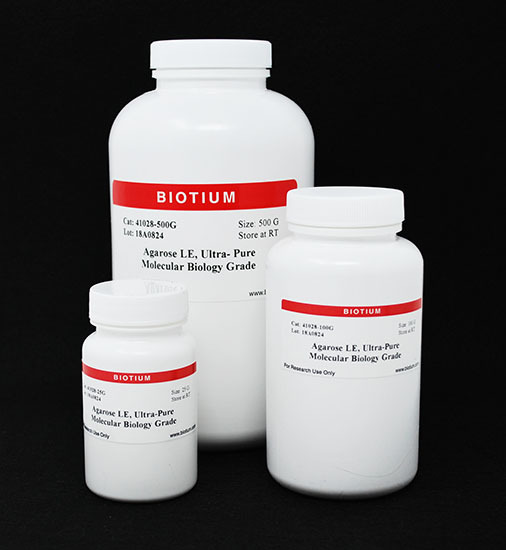 Ultra-pure LE Agarose can be used for all routine electrophoresis applications. It has low electroendosmosis (EEO) which confers high electrophoretic mobility. This agarose has excellent performance for analytical or preparative nucleic acid electrophoresis and blotting. Ultra-pure LE Agarose has high strength and shows low background after staining with common nucleic acid dyes. Each lot is validated for use with Biotium’s GelRed®, GelGreen®, and DNAzure® gel stains. Also see our GelRed® Agarose, precoated with non-toxic, non-mutagenic GelRed® Dye, for greater safety and convenience.